I saw this the other day and meant to post it. Enjoy. KANSAS CITY, Mo. — When John Totaro and his wife, Lynn DeLeo-Totaro, visited here in August, it didn’t take them long to spot the National World War I Memorial. Soaring 217 feet into the skyline, the tower — originally called the Liberty Memorial and now part of the National World War I Museum and Memorial — is hard to miss. Built from 1923 to 1926, it is a bold reminder of the conflict in which 53,000 Americans died in combat, according to the Department of Veterans Affairs. Veterans Day (formerly Armistice Day), on Nov. 11, was established to commemorate it. While the memorial honors this city’s residents who served in World War I — in particular, the 441 who died — it is also a tribute to local residents who, during two weeks from late October to early November 1919, raised more than $2.5 million (roughly equivalent to $34 million today) for the memorial. About 83,000 residents, more than a quarter of the city’s population at the time, donated an average $30 each (about $413 today) to the fund-raising drive, much of it done by children going door to door. When parts of the memorial began to deteriorate in the 1990s, city residents voted twice more to honor those it represented. In 1998 voters passed a limited-duration half-cent sales tax that raised $30 million, and in 2004, a bond issue helped create an expanded 115,000-square-foot museum and research center under the memorial’s courtyard. It opened in 2006, and that year Congress designated it the National World War I Museum. As it nears its 10th anniversary — dovetailing with the World War I centennial — attendance is growing: up 15 percent in 2014, to 235,271 visitors. Museum officials said they were on track to exceed that in 2015. Despite the memorial and museum’s resurgence, a question often asked is why the United States’ official museum about the First World War is in Kansas City, the country’s 37th-largest city. Gen. John Pershing, who led the American Expeditionary Force during the war, grew up in Laclede, Mo., about 90 miles northeast of here. The general, known as Black Jack, was on hand for the dedication of the site in November 1921, along with top military commanders from other Allied nations. The architect chosen was a New Yorker: Harold Van Buren Magonigle, whose works include the U.S.S. Maine Monument at the entrance to Central Park, at Columbus Circle in Manhattan. Built on the top of Vinegar Hill — one of this city’s highest points — and overlooking Union Station, which opened in 1914, the memorial consists of the cylindrical tower, connecting the original museum building with the new one. The tower is laden with symbolic extras, including four 40-foot-tall “Guardian Spirits” surrounding the top of the tower; and two Assyrian sphinxes — part lion, part bird, part human — at the tower’s base. One, called Memory, faces east toward France, where most of the fighting took place. The other, Future, faces west, to uncertainty ahead. Along the north wall of the memorial is an 18-foot-high, 148-foot-long sculpted frieze that depicts the transition of American doughboys from war to peace. In the post-World War II period, the memorial’s stairway and courtyard began to decay, along with the neighborhood around it. A nadir was the memorial’s closing on Veterans Day, 1994. “A growing consensus emerged that we had to do something,” said Derek Donovan, author of “Lest the Ages Forget,” a history of the memorial. As in 1919, local residents came through, voting to tax themselves to help restore the museum. Visit Spain– Summer 2017– Pray at the tomb of St. James the Greater! The SJA Social Studies department is visiting Spain in June 2017, and you’re invited! Classes of 2017, 2018, 2019 are eligible (you must have completed your sophomore year before June 2017). On this 13-day trip, we will explore the history, culture, tradition of Spain. By special arrangement, we will spend 2 nights in Compostela, the city with the remains of the St. James the Greater– our patron saint! 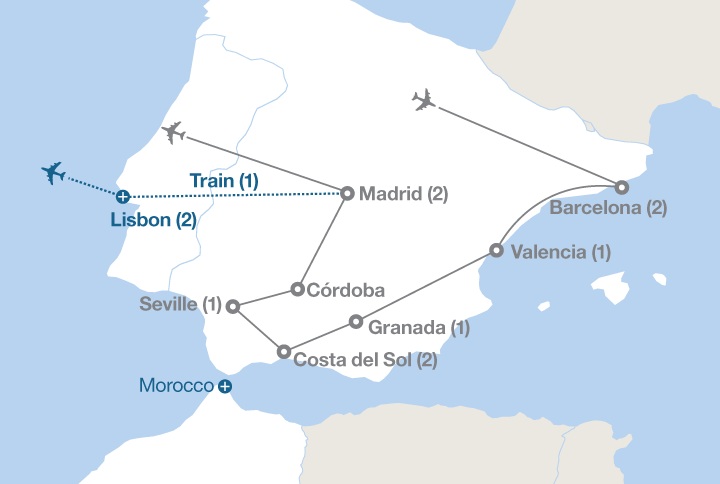 The trip will explore the Spanish cities of Barcelona, Valencia, Granada, Cosa del Sol, Seville, Cordoba, Madrid, and Santiago de Compostella. We may also have the opportunity to take a day-trip to Morocco in north Africa! Space is limited; spots will be filled on a first-come, first-serve basis.